Like so many other simple tools, paintbrushes are more complicated than they might seem. The lowly paintbrush: We’ve known about it since preschool days. Paintbrushes were great fun in kindergarten, too, though for a lot of us they’ve become less enjoyable as the universe of painting tasks has grown by leaps and bounds. For anyone who lives in an antique, wood-frame house, the paintbrush is rarely out of mind or far from reach. The paintbrush is, like so many simple tools, more complicated than it seems. The shape of the wooden handle, for example, is comfortable and efficient—and not by accident, because it has evolved over many centuries to its present contoured shape. It suits the working hand, the fingers and thumb holding the broad end (the stock), the other end fitting into the fork formed by the thumb and forefinger. The paint-absorbing filling isn’t merely clamped in the metal ring (the ferrule) that connects the brush to its handle. Before the ferrule is wrapped around the handle and brush, the filling is dipped in a set­ting compound, oftem made of epox, that binds the bristles together. Actually, the word bristles is sometimes the wrong one. Bristles occur in nature: They are the hair of hogs. But many brushes use other mate­rials, both natural and synthetic. The best brushes consist of individual filaments that, like a hog bris­tle, taper toward the end, then split, forming what are known as flags. The flags help hold the paint and to spread it evenly. Some synthetic bristles, in addition to tapering and splitting, are textured as well. Buying Brushes. I’m no longer surprised at how much the best brushes cost. Having learned a long time ago that for high-quality jobs they are essential, what I’m now surprised by is how long good brushes last and how much easier they are to use than cheap brushes that seem to self-destruct halfway through a job. Before you buy a brush, inspect it carefully. The bristles should be flexible, but stiff enough that they spring quickly back after you spread them between your fingers. Make sure there are no manufac­turing defects, like a poorly attached ferrule or uneven trimming of the brush tip. A quality brush will, if properly cared for, last from one job to the next. It will spread the paint more easily and evenly, carry more paint from the bucket to the surface being painted, and is less likely to leave telltale bristles behind to mar your perfect paint job. Flat Brushes. When we think of a paintbrush, it is the traditional flat brush that we usually have in mind. It’s used to paint all sorts of sur­faces with paint or varnish, whether these be walls or trim or objects. Flat brushes come in an array of sizes, from as little as half an inch wide to four and five inches across. The widest are usually called wall brushes, narrower ones varnish brushes. The proper use of a flat brush involves more than dipping the brush in the paint and brushing it onto the wall. There are a couple of small tricks that make painting a more efficient process. The grip is important: Grasp the ferrule, the metal band around the brush, between your thumb and fingers. This grip is less likely to cause cramping when you must paint for long periods but, equally im portant, it disciplines your stroke. It’s like throwing a Frisbee: It’s all in the wrist. A gentle back-and-forth swing of the wrist produces even, comfortable strokes. Don’t dip the brush too far into the paint (a third or, at most, a half of the bristle length is far enough). 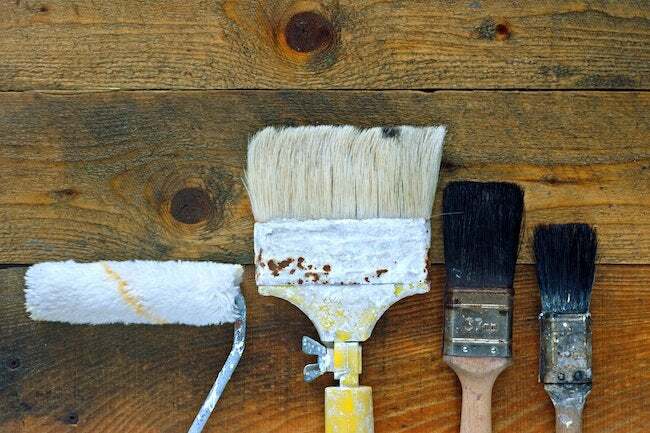 As you remove the brush from the can after dipping it, remove excess paint from the bristle by drawing each side of the brush gently along the edge of the paint can. Apply the paint evenly. Avoid too much paint: The excess will pro duce drips and little rivulets that will spoil the even finish. Keep the handle raised above the bristles, so that the paint won’t drip into the ferrule. If it does, you’ll find it dripping onto your hand, and drops will gradually appear everywhere around you. Sash Brush. Sash brushes have slightly beveled tips, which makes paint ing window muntins and other narrow trim easier. Some brushes also have ends that have been trimmed at an angle to the handle of the brush. Credit some unnamed painter of the past with devising this clever and oh-so-simple solution to painting tricky, angled areas, especially corners. It’s still a simple flat trim brush, usu ally an inch or an inch and a half wide. But the angled lip makes paint ing edges immensely easier, permitting the painter to see more clearly what he or she is painting, and angling the brush in such a wav that it is less likely to apply paint to areas where you don’t want it. The sash brush is sometimes referred to as a chisel-edge brush. Paint Roller. Rollers paint large flat areas like ceilings and floors. They use less paint than brushes do; they spread the paint more evenly than a brush; they make quick work of large, flat areas. The covers are replaceable and the handles reusable. The nap or Fi ber on the roller covers varies, and should be matched to the paint you are using (longer fibers for rough surfaces, low-nap for smooth ones; different paint bases and finishes require appropriate rollers, too). The bulky roller does not reach into corners efficiently, so paint the edges with a brush first, then roll into them. Standard rollers are seven inches and nine inches wide, though narrower trim rollers (three inches wide) are also available. Paintbrush Advice. Paint in long strokes and always keep a wet edge. Keep the light source between you and the surface if possible, and take special care at the edges, corners, and joints you encounter, those be ing the places where drips and runs are most likely.